1963 Renault Life Magazine Advertisement. Now That Renault is Automatic, How Do You Get a Stick Shift? Ask Your Dealer. Ad is 13 1/2" high and 10 1/2" across. Very good condition. Suitable for framing. 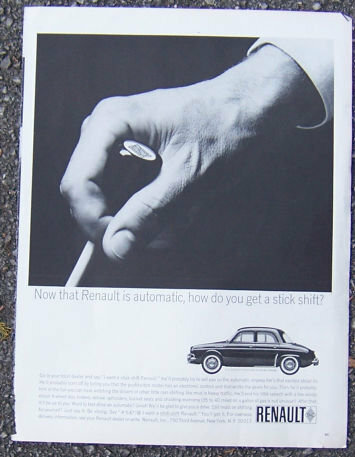 Items Similar To "1963 Renault Stick Shift Automobile Magazine Ad"